Are you living life without a compass, being swept along without direction and purpose? Are you on the solitary journey through grief and loss? Are you an overwhelmed mother wanting to make the most of the years you have with your children? Are you longing for love and wondering if God cares for you anymore? Are you finishing a season and longing for a fresh calling? When you lack clarity about your life direction as a woman, it’s easy to feel isolated and alone, as if something is wrong with you. But nothing could be further from the truth. However, unless you have a guide to walk with you on life’s journey, you can easily think that life just doesn’t work out for you. You can let fear of an uncertain future control you and keep you from stepping into the special season of life God has designed for you. You can miss the blessings, both now and for future generations, that God has planned for your life. Just like the Israelites who passed through the Jordan River so long ago, you too can place stones in the river to serve as the spiritual markers of Gods faithfulness through every season. Jo Jackson has been where you are. She has experienced the highest joys and deepest sorrows of life s journey. That s why you won’t get cliches or pious platitudes from her. As a grandmother to more than 20 children, she lovingly invites you to join her for an authentic journey through the twelve stones in her own river of life, so you can learn from her and discover your own purpose. Throughout the more than 350 beautifully designed pages, Jo shows you what a life fully lived looks like. She shares the good and bad, the joys and pains. She guides each reader to more fully appreciate God’s unfailing love and faithfulness. From the exquisite photography, to the aesthetic beauty and intentional placement of each word on every page, to the heartfelt passion and raw sharing of her story and wisdom, every page reveals a little broader glimpse of God’s grace. As you turn each page, perhaps while sipping your favorite tea in your favorite chair, you’ll begin to see your own story unfolding alongside Jo’s tale. 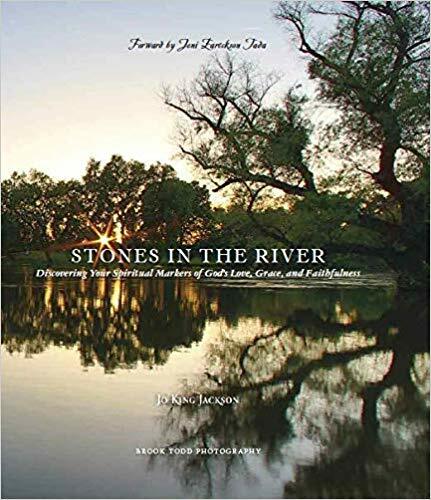 Like the endearing guide she is, Jo lovingly challenges you to choose your own spiritual markers, the stones in your river of life.